Reading the triumphant provincial announcement on Nov 10, it seemed the decision was final — a 4.1 trillion won, 13.99-square-meter, single-runway airport would be built in Seongsan-eup by 2025. The province’s “Second Airport Plans Confirmed” banners, prominently hanging in Jeju City, celebrate the project as a done deal. 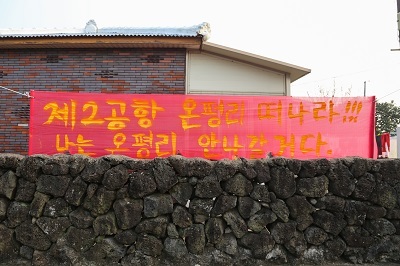 Far from being finalized, however, local villagers told The Jeju Weekly on Jan 4 that the project plans and budget still require validation from the Ministry of Strategy and Finance. 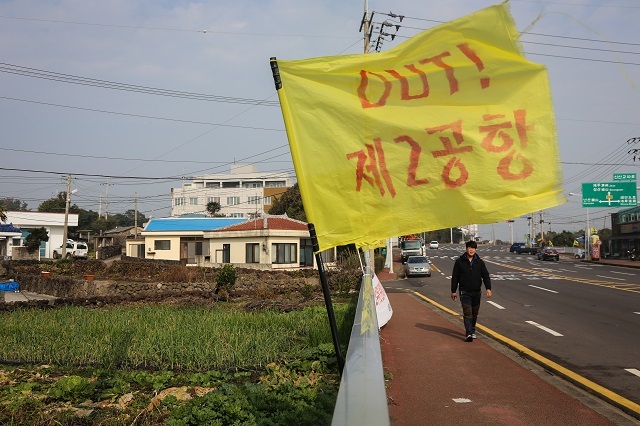 Yellow and red protest flags adorn roads, cars and buildings throughout Onpyeong-ri, Sinsan-ri, Susan 1-ri, Nansan-ri and Goseong-ri, making clear how the villagers directly affected by the airport plans feel about the announcement. Kang Won-bo, head of policy for the Sinsan-ri Emergency Committee, said that the project still lacks National Assembly approval. “This is the procedure, but the local government announced it was finalized. It is not finalized,” said Kang. Just a portion of the airport will be within Sinsan-ri, but Kang says proximity to the 24-hour runway will severely impact their quality of life. Do they just want it built elsewhere? Yang stays to talk before heading off to his farm, saying that although he understands the motives behind the airport project, he is incredulous that the site chosen sits at the center of five villages, rather than at the coast or on reclaimed land. “That’s incomprehensible... No matter what the budget plan is, it cannot be understood,” he said. Most locals we spoke to believe the best option for the whole island is seaward expansion and land reclamation at the current airport. Another popular option, shared by Yang, is the adaptation of Jeongseok Airfield, a Pyoseon-myeon site owned by Korean Air and used for aviation training. The government states that the site was not even considered as the upland weather conditions are unsuitable for commercial flights. Yang refutes this claim. ▲ Seongsan-eup streets are lined with protests flags. “KAL already flies Boeing 747s at the airfield,” he says, adding that locals suspect conglomerate interests influenced the decision-making process. To cool local unrest, the authorities now make daily visits to the region, and particularly to Onpyeong-ri, which will host 76 percent of the airport across 46 percent of its land. The message hanging from flags here is clear: “Gieonara!” — Get out! in the Jeju language. Sixty families will be moved from their homes and many more will be forced out by the anticipated noise disturbance. Governor Won Hee-ryong has vowed to compensate any families uprooted by the project. Indicative of the controversy was the briefing held on Jan 7 by Jeju province and the Ministry of Transportation. 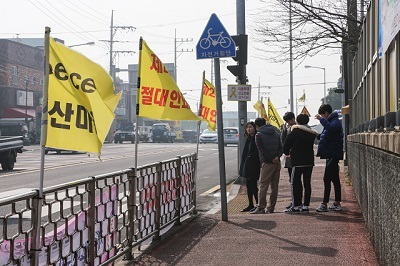 The event was planned for Seongsan National Sports Centre, but after protesters blockaded the entrance it was moved to the Seongsan-eup office. As officials tried to repeat the airport plans, villagers doubted their intention to debate the issue: “If only the police and public officials are listening, who is this briefing for?” they asked. A villager then took the mic and read out a prepared statement. ▲ Onpyeong-ri mayor Lee Seung-i. The emotions were real, as this is not just any corner of Jeju Island. Onpyeong-ri village is home to one of Jeju’s most sacred historical sites, Honinji Pond. The three founding fathers of Jeju, Go, Yang and Bu, married three divine princesses on this picturesque spot. Many people regard it as the heart and soul of Jeju Island. In the village office, we sit down with a drained and emotional Mayor Lee Seung-i. Lee says the wetland site, just meters from the airport perimeter, will be encircled by development. Lee wants a province-wide debate on the issue. While one corner of the island, in the shadow of UNESCO-designated Sunrise Peak, has certainly woken up to the reality of the airport project, it heralds unprecedented change for the whole island. It will operate around the clock, allowing the island to process up to 40 million tourists every year, up from the current 23 million (assuming continuous growth in Chinese visitor numbers). Recognizing the impracticality of residential development in the area, an “AirCity” commercial zone will be created, and overseas investment encouraged. Back in Sinsan-ri, Kang says islanders are not thinking about the long-term urban and commercial sprawl that will damage the environmental and cultural heritage of the island’s southeast. 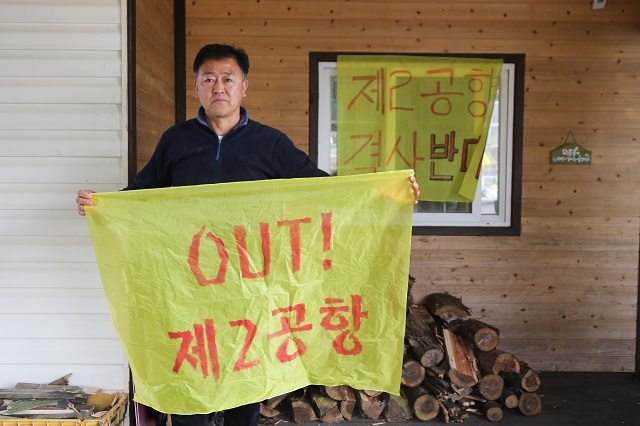 ▲ Onpyeong-ri villagers show their opposition. He says people are under “mass hypnosis” and wants the authorities to look beyond short-term profits and give more thought to the island’s sustainable carrying capacity. “They do not know that they are killing the goose that lays the golden egg,” he said. Mayor Yang of Sinsan-ri sees plenty of potential for Jeju growth, but says it must be qualitative, not quantitative. He would like to see Jeju marketed as a premium destination to increase value for locals and keep tourist numbers manageable. “They say we have 20 million tourists annually, and 40 million by 2025 but, from Jeju locals’ perspectives, 40 million, 50 million, even 1 billion tourists is no better for us,” he said. In response to the criticisms, Governor Won Hee-ryong claims Jeju people have long called for a second airport. The case for expansion of airport infrastructure is strong. Jeju International Airport is saturated. Only Gimpo Airport is busier in the nation, and the route between the two airports is the busiest on the planet. The lack of public consent, he added, allowed the decision to be made according to the highest safety, environmental and economic standards, and minimized land speculation. 3) Maintaining the existing airport and constructing a new one. 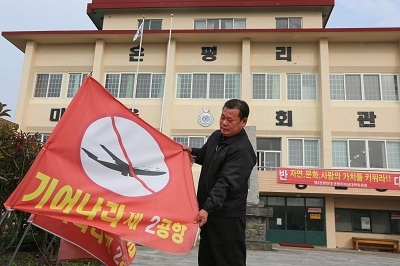 Although the Seongsan-eup villagers dispute the figures published, and want the full study made public, the province says that seaward expansion of the existing airport is not economically or environmentally sound. Having settled on the third option, Seongsan was deemed to offer the best economic value, with minimal social and environmental damage. The social damage can be seen already, and environmental damage is unavoidable, and, perhaps, unknowable. A source of both hope and fear for Seongsan locals is the presence of at least 18 subterranean lava tunnels crisscrossing the landscape. Susan-ri villagers have written to the IUCN seeking support in protecting the sites from development; research has been commissioned to ascertain their ecological and geological worth. As they appeal for support provincially, nationally and internationally, villagers ask for people to show their support by joining protests and speaking out through media channels. Although they want to cooperate as much as possible with the authorities, they have vowed to fight for their homes and, they say, the island’s future. “I think it is going to be really tough. We are just a drop in the ocean. The anger that I feel is so strong, though, that I will resist it with all my might. We can take hope from that,” said Kang. For more images by photographer Yoki S Jeong visit here. Time to cap Jeju tourist numbers?